Whitby Town made the perfect start to life after Darren Williams, securing a 4-1 home win over Mickleover Sports on Saturday. Caretaker boss Lee Bullock guided the Blues to an emphatic victory, aided by a fine team performance, with returning midfielder Dale Hopson an influential figure. Hopson, who Williams had worked hard to bring back to the club prior to his dismissal last week, scored one and was named man of the match as Town moved to within five points of escaping the Evo-Stik Premier Division relegation zone. 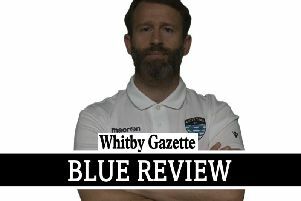 It was however Mikey Roberts who set Whitby on their way, nodding in Ryan Brobbel’s cross in the 42nd minute after Matty Waters had twice gone close to putting the hosts in front following a strong start to Bullock’s first game at the helm. Five minutes after the break Dave McTiernan also headed home to take the score to 2-0. Nico DeGirolamo pulled a goal back for Sports just three minutes later, but Whitby went back down the other end and Hopson capped a fine display with a tidy finish at the back post. With a two-goal cushion the Blues looked in control and Kieran Weledji got forward from right-back to fire home a fourth goal for Bullock’s charges in the closing stages. Full match report and reaction, plus more pictures by Brian Murfield online and in Friday’s Gazette.